When planning for Super Bowl LII began more than a year ago at ESPN, the network’s operations folks knew one thing was clear: they were going to bring their studio shows onsite, and they were going to be inside. There would be no messing around with the winter weather. ESPN has a 40-ft. by 30 ft. main stage anchoring its Super Bowl Week coverage from the IDS Center in Downtown Minneapolis. That’s when they found a location in the heart of Downtown Minneapolis inside Crystal Court, a closed lobby within the tallest building in Minnesota, the IDS Center. It attracts crowds and proved to be an ideal location for ESPN’s week-long presence in the Twin Cities. The location did lead to some challenging fiber runs, but it has worked out for ESPN. Ops Producer Kristianna Bryant worked closely with the building to even pop out some windows in the building to feed the fiber inside. Trusses are set up in multiple locations for the more than 1,500 ft. of fiber-optic and power cable carefully run along the indoor mall to reach ESPN’s 40- by 30-ft. main stage as a smaller standup location on the second floor. According to Young, it took a crew of five people two nights to run all of the cable necessary. At the IDS Center, Senior Coordinating Producer Seth Markman and Coordinating Director Michael Fineberg have established a strong gear lineup to complement the set. There are three hard cameras, a handheld, a jib, a Steadicam, and three additional drops to cover the set from the second floor. There’s also an iPhone using the TVU app to send a beauty shot of the stadium from the 47th floor of the building. 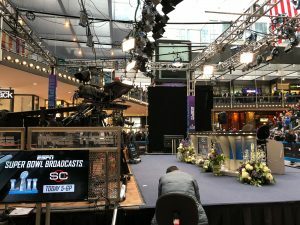 ESPN has been logging heavy hours on its IDS Center set, going on the air at various points from 7 a.m. to 8 p.m. CT with hits to SportsCenter, The Scott Van Pelt Show, and full editions of NFL Live and Super Bowl Sunday’s Postseason NFL Countdown. All shows, especially this weekend, have had huge crowds on hand. 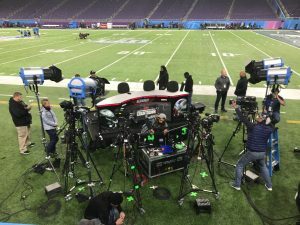 At U.S. Bank Stadium, ESPN needed to scrap its Monday Night Countdown set and erect a smaller, 8- by 12-ft. rolling platform to fit on the sidelines. As for the on-field set at U.S. Bank Stadium, ESPN has had to work on the fly and make some last-minute adjustments. One of the pros and cons at U.S. Bank Stadium is that it features the tightest sidelines of any venue in the NFL. That makes for a fantastic in-stadium fan experience but does lead to challenges for broadcasters’ activity on the sideline. Given the nature of the field, ESPN was not able to bring its traditional Monday Night Countdown set, which is on the field every week for Monday Night Football. Instead, the broadcaster needed to put together a smaller, 8- by 12-ft. rolling platform with a Versa anchor desk to meet the requirements of the space.